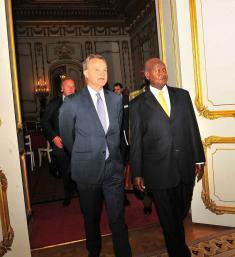 President Museveni attended a three-day working visit to the United Kingdom where he opened the UK-Uganda Business Conference at Lancaster House in London which ended yesterday may 8, 2014. President Yoweri Museveni has said that the problem in Africa was the failure by Africans to realize that other continents have left them behind and that they need to invest in infrastructure for their countries to develop. 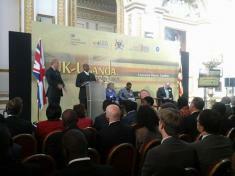 President Museveni has this morning opened the Round Table on Uganda Energy Development at Lancaster House. peaking at the Round Table, the President informed the UK industrial and business community that by finding petroleum Uganda was able to demonstrate that there is Petroleum in Africa's rift Valley. President Museveni, who is on a three day working visit to the United Kingdom, has today opened the UK-Uganda Business Conference at Lancaster House in London. 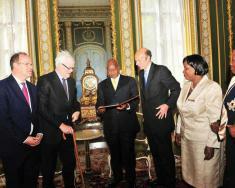 The Minister for Africa in the UK, Hon Mark Simmons, The Chairman of the Commonwealth Business Council, Lord Marland of Odstock, Honourable Ministers and Representatives of the Diplomatic Community in London, Esteemed Members of the Business Community in London and Uganda, Ladies and Gentlemen.